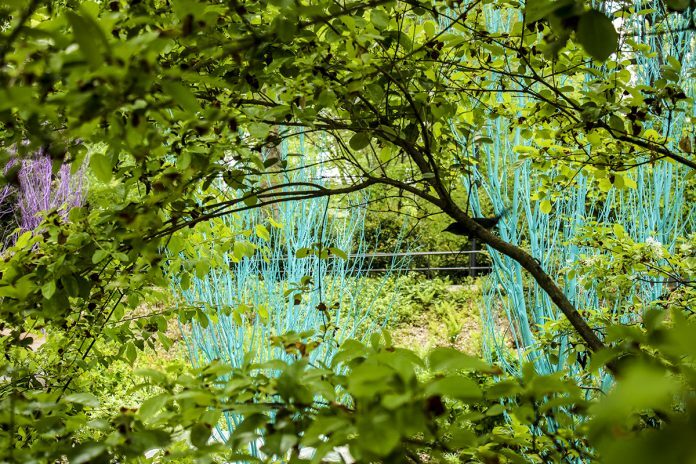 The Curious Garden will bring a grove of candy-colored trees to the Atlanta Botanical Garden. What: This world-premiere show based on the children’s book series will feature everyone’s favorite blue cat, who skateboards, surfs, and (of course), sings. What: The Gainesville branch of the ABG hosts an exhibition of 23 large copper frog sculptures from North Carolina metal artist Andy Cobb. What: The High continues its series of picture-book exhibitions with this show highlighting the work of 93-year-old Ashley Bryan. Taken together, his books—many of which draw on the black oral tradition—are a timeless celebration of African American experiences. Visitors can see over 70 works of art from 20 of Bryan’s books (all displayed at kid-height) and stick around for storytelling. What: Watch traditional Mexican dances, create your own homemade instruments, and hear a Cinco de Mayo story in this weekend celebration of Mexican culture. What: Every spring the Atlanta Botanical Garden decks itself out with a special art exhibition, and this year the event will coincide with the opening of the Skyline Garden, which offers breathtaking city views. Throughout the garden, find 11 site-specific installations by Adam Schwerner, an artist who designs gardens for Disneyland, and one of the highlights is a grove of candy-colored trees that look as though they were lifted straight out of Fantasia. What: Watch a may pole dance performed by Serenbe residents’ children, hear live music, watch strolling performers, and more at this annual Pinterest-perfect spring festival. What: Kids love ’em, parents (let’s be honest) kinda love ’em too. Bring your dancing shoes to this family-friendly concert featuring enthusiastic kid covers of all your favorite Top 40 jams. What: The Decatur Arts Festival kicks off with a glowing procession of homemade paper lanterns. The parade starts at the Color Wheel Studio on East Howard Avenue, and then meanders all the way to the Decatur Square, accompanied by music from the Black Sheep Ensemble. What: Gioachino Rossini’s operatic take on Cinderella, which he called La Cenerentola, is a frothy comedy that highlights the importance of Cinderella’s courage and kindness over the magic of fairy godmothers. Introduce your kids to the dramatic genre of opera in this special 1-hour version designed for students in kindergarten through 12th grade. Cost: $30 ($25 for members). Advance registration required. What: Beat the heat this Mother’s Day by piling into a canoe and paddling to Riverside Park. For a little extra (cool) fun, the folks at CNC will distribute water squirters. Ages 6 and up. What: Treat your Captain Hook and Tinkerbell fans to this touring Broadway musical, about the life of Peter Pan author J.M. Barrie. What: Northeast Atlanta Ballet stages this fairy-tale ballet based on the Middle Eastern folk tale. What: The popular neighborhood fest includes all the usual highlights: a home tour, 5K, barbecue cook-off, artists market, food trucks, live music, and (of course) a kids area. What: One hundred years ago, an enormous fire nearly destroyed much of Atlanta, and the Old Fourth Ward was particularly devastated. Celebrate the neighborhood’s rebirth—and recent resurgence—at this annual festival, featuring fire sculptures, circus performers, live music, a kids area, and an interactive installation about the history of Boulevard. What: Be among the first to see the History Center’s new exhibition, timed to the 100th anniversary of America’s entry into WWI. Back then, most Americans were reluctant to get involved in the war, so to sway public opinion the government commissioned a series of propaganda posters from renowned artists. This exhibition provides a rare glimpse at some of the graphic artworks, and a great opportunity for kids to learn about this chapter of American history. What: It’s pretty hard not to have fun at a WNBA game. Cheaper tickets mean you can get closer to the action than at an NBA matchup, leaving extra cash for hot dogs and popcorn. Come cheer on the Dream in their season opener at McCamish Pavilion: the team’s new home base. What: Does your child spend his or her days dreaming of all things princess? Pack their tiaras for this 5th annual event, during which Disney royalty (from Belle to Moana to Elsa) will be on hand for a musical stage show and photo session. Proceeds benefit Girl Talk, a peer mentoring program for girls. When: 9:30 a.m. to 2 p.m.
What: Part of the Decatur Arts Festival, this event includes a stroller, bike, and trike parade (with a prize given for the best decorated wheels); juggling; balloons; live music; clowns; inflatables; and a gaming truck.